Hi and welcome on this last day of May. First of all, I want to wish our beautiful daughter Laura a Very Happy Birthday! You have blessed our lives in so many ways and we wish you all the blessings life has to offer. Once again, it's Inspiration Wednesday at Heartfelt Creations and I'd like to share a card I made using the absolutely gorgeous Classic Petunia Collection. Other Products: Pearl White Metallic Cardstock, Green Cardstock, Butterfly Embossing Folder, Misti, Big Shot, VersaMark, Ranger Magenta Embossing powder, Double Sided Adhesive, Dimension Foam Tape, Swarovski Crystals. Instructions: Create a 6 x 6 card base using the Pearl White Metallic Cardstock. Using green cardstock, cut a 5 7/8 x 5 7/8 mat layer. Starting at the top left of the green layer, add a 4 x 4 piece of double side adhesive. Add Rajni Chawla’s Crystal Clear to the adhesive and burnish. Cut a Pearl White mat layer 5 3/4 x 5 3/4 and emboss it with the butterfly embossing folder. Cut an aperture in the top left side of this layer using the Decorative Butterfly Corner Die. Glue the white layer to the green layer and then adhere to the base using dimensional tape. Cut a 5 7/8 x 5 7/8 panel from the Classic Petunia paper pad and adhere to the inside of the base. 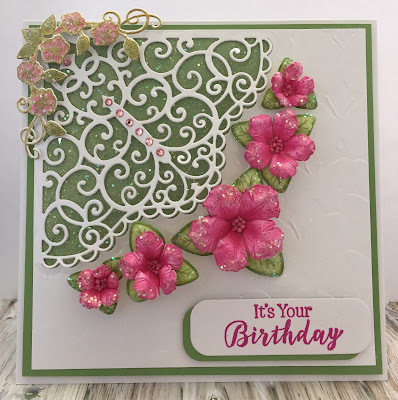 Stamp the Classic Petunia leaves with Bamboo Leaves ink and die cut using the Classic Petunia Die. Ink the edges and color using the Stack and Store Daubers. 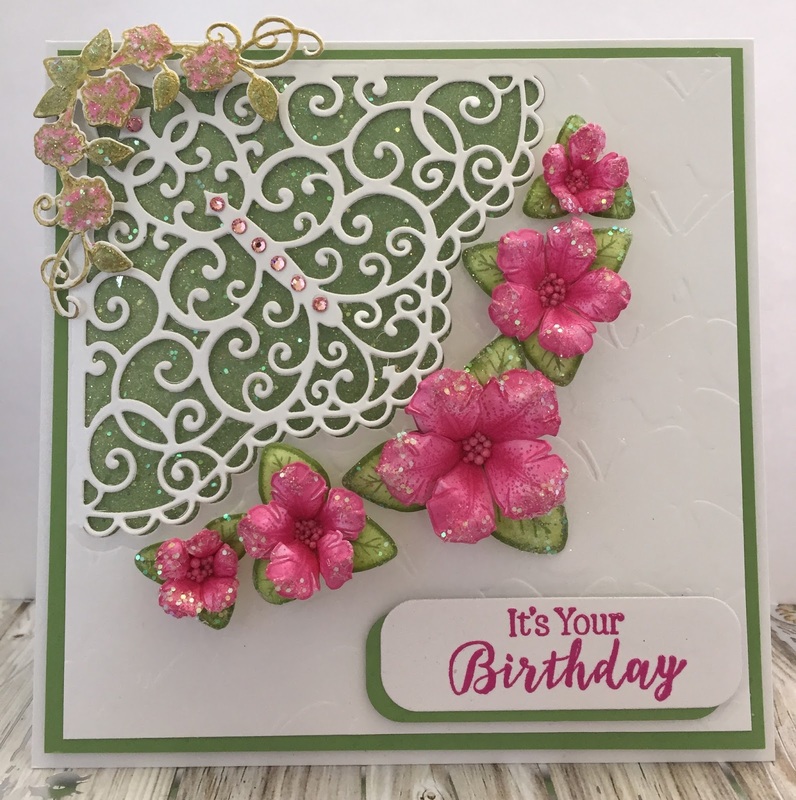 Stamp the Classic Petunia flowers with Berrylicious ink and die cut using the Classic Petunia die. Color the flowers with Berrylicious and Rose Bud inks. Shape the flowers and the leaves with the Deluxe Flower Shaping Kit, add Prills to the centers and glitter with Rajni Chawla’s Crystal Clear. Stamp the Classic Petunia corner bouquet with VersaMark, emboss with gold embossing powder, color and shape. Stamp the sentiment with VersaMark and heat emboss with Magenta Embossing Powder. Using the Cut Mat Create Die, cut out the sentiment and mat it with a green layer. Add the flowers, leaves, corner bouquet and Swarovski crystals to the card as shown. Adhere the sentiment using dimensional tape. Thank you so much for stopping by and please make sure you visit the Heartfelt Creations blog https://www.heartfeltcreations.us to see all of the magnificent projects created by the fabulous design team. Jan this is so beautiful! I just love all the attention to detail! You never fail to amaze me, this is gorgeous!!!! Oh beautiful!! 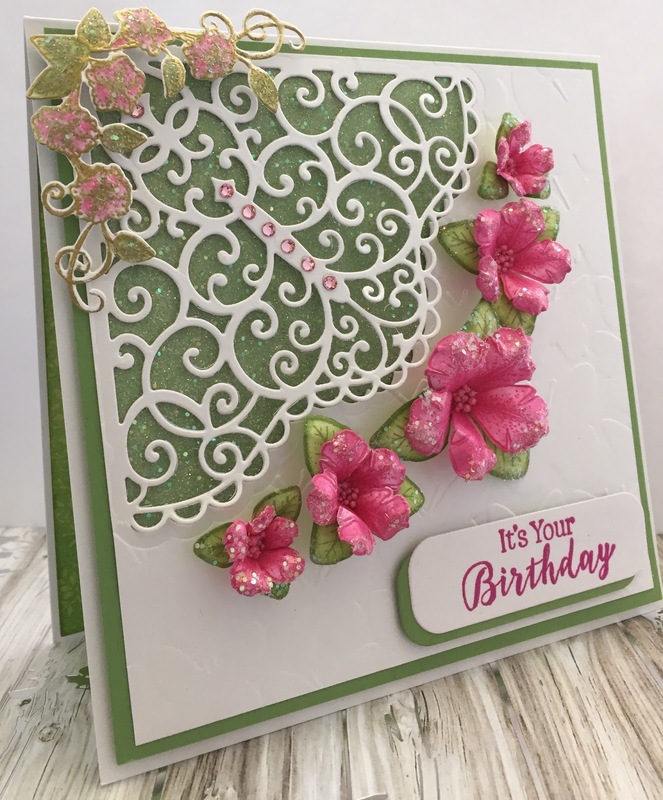 I love that corner die and your flowers below give an impression of a fan! Just gorgeous!